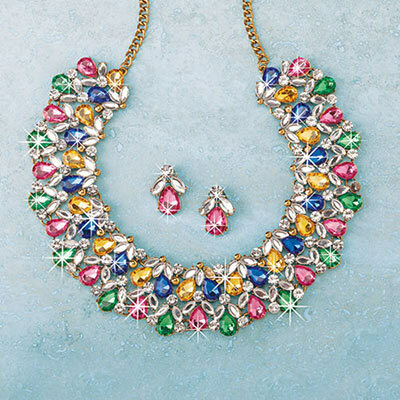 This sparkling Radiant Sparkle Jewellery Set sets the stage for opulence and refinement. The exquisite collar-style necklace is encrusted with a kaleidoscope of colourful, faceted faux gems and twinkling clear crystals. Earrings feature teardrop stones accented by clear crystals. Necklace, 16"l with 2½" extender; Pierced earrings, 1"l.